25mm webbing by Echino. Green stitches on green webbing. ECH-78. 92% Acrylic, 8% Polyester. Echino Fabrics. JG-96500-501B. 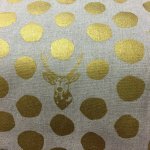 Metallic gold dots and deer heads on a natural background. Fabric Details 45% Cotton/55% Linen, 44/45" wide. Etsuko Furuya for Echino Piece. Multicolored Patchwork. JG-95800 801 D11 Fabric Details 45% Cotton/55% Linen 44/45" wide. 25mm webbing by Echino. White stitches on black webbing. ECH-79. 92% Acrylic, 8% Polyester. Etsuko Furuya for Echino. 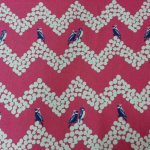 White polka dotted chevron stripes with navy and white birds, running selvedge to selvedge on a pink background. JG-96000-603A. Fabric Details 45% Cotton/55% Linen. 44/45" wide. Lightweight canvas. Etsuko Furuya for Echino. 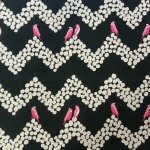 White polka dotted chevron stripes with pink and white birds, running selvedge to selvedge on a black background. JG-96000-603D. Fabric Details 45% Cotton/55% Linen. 44/45" wide. Lightweight canvas. Etsuko Furuya for Echino Samber. 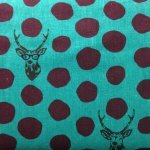 Brown buck heads with brown dots on a turquoise background. JG-96000-604B. Fabric Details 45% Cotton/55% Linen, 44/45" wide. Lightweight Canvas.